Yelawolf and Travis Barker could basically be twins, so it only makes sense that the acclaimed drummer and Alabama rapper did a two-face split for their collaborative EP, Psycho White. 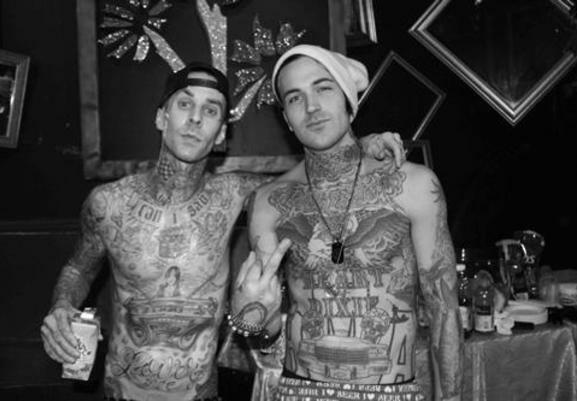 Travis and Yelawolf unveiled the tracklist for their EP, which boasts a quick and easy five tracks. Yelawolf fans are still waiting patiently for his sophomore album to drop, but Psycho White is perfect to hold them off for a little bit. The Psycho White artwork was designed by Franco Vescovi, who released a video explaining how he came up with the concept and executed the final cover. DETAILS: ALL IN THE FAMILY! Yelawolf Confirms "County Cousins" Collaborative Album With Big K.R.I.T.! Psycho White is slated to drop November 13. Do you like Travis and Yelawolf's Psycho White cover?